Aloha. 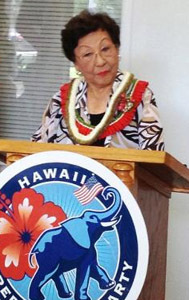 The Hawaii Republican Assembly periodically shares important information about happenings at HIRA with Republicans and conservatives in the Aloha State. Here is our latest e-newsletter. and to keep politicians from both parties accountable year-round. Therefore, HIRA plans to spread the word in 2014 with an annual legislative scorecard telling everyone which politicians are willing to fight for our values, which ones are lost aimlessly in the wilderness of indifference, and which ones have thrown in with the liberal status quo. HIRA wants to arm voters, donors and activists alike with ratings of their incumbents because we believe a politician’s voting record in office is the most useful information that can be made available during an election year. This way, people can see for themselves just how conservative or how liberal their elected officials have turned out to be on issue after issue: Did they keep their campaign promises or did they break them? Are they part of the solution or part of the problem? But to be effective and thorough, HIRA would like your assistance. We believe that you, as a party member, should have a say in what matters, what we stand for, and in judging how well or how poorly elected officials are doing. In order to make sure that HIRA’s scorecard covers the widest range of important issues possible, we want to solicit your very important input right away. So please let us know what you believe the biggest issues are as represented by bills which passed or failed during the 2014 legislative session . . . and don’t worry, SB1 from the November 2013 special session is already on the list. Just e-mail us the bill number and/or name of the legislation which either passed or failed along with your opinion about why legislators can be judged as conservative or liberal because of their votes on this bill. 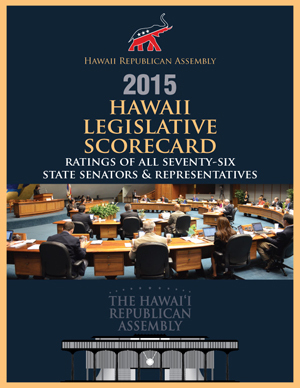 The dedicated new e-mail address is: scorecard@hawaiirepublicanassembly.com. This project is especially important for Republicans, since our state party leaders have publicly decided to continue remaining completely neutral on the issues in 2014 and beyond. Our party platform is officially silent on every challenge facing Hawaii; challenges specifically brought on by Democrat liberal policies. This weekend’s highly orchestrated state convention is scheduled to endorse another two years of party neutrality in its official platform . . . charging Republicans $70 each to go through the motions and participate in a political convention of meaninglessness. Well, HIRA believes this is completely unacceptable! Republicans must not be neutral. We can’t afford to be seen as a ‘party of nothing’. We cannot abandon our principles for some false unsubstantiated assumption that we will attract more Republicans if we drop what differentiates us from Democrats. We must stand for clear policies that repeal and replace failed Democrat policies. That’s what voters want and deserve. That’s how Republicans can and will become Hawaii’s majority party. 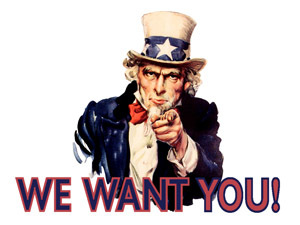 As Hawaii’s official conservative Republican organization, we at the Hawaii Republican Assembly will fill this void by giving voice to real Republicans in Hawaii who do not think it’s a good idea to sit on the sidelines and be neutral while Democrats get away with 60 years of mismanagement, malfeasance, and outright crime. HIRA hopes to hear from all Republicans across the state so we can keep politicians accountable. Remember, they work for us; not the other way around. Thanks in advance for your kokua!